Building site hoarding is essential to keep both construction site workers and members of the public safe. It’s also one of the most cost-effective advertising spaces for your new housing development and vital to drive marketing suite visits, enquiries and build a database of interest pre-launch. If you are responsible for marketing, you’ll no doubt be looking across multiple channels at the most cost-effective ways to raise awareness of your new development. Advertising hoarding panels are a superb communications channel since they are exceptionally good value. A 48-sheet advertising billboard is likely to cost over £1,000 for a month’s advertising spot. Whereas, the equivalent hoarding in square metres will cost around half that price. When you consider that hoarding could be in place for 12 months or more, the comparable savings are easily more than £10,000! Additionally, you can also refresh your hoarding panels in that time and adapt messaging based on interest and sales, or even advertise other developments and still make significant savings. One of the key elements to get right is a professional site survey as this ensures messages work across numerous panels, which may have to be professionally installed at a gradient or around street furniture. 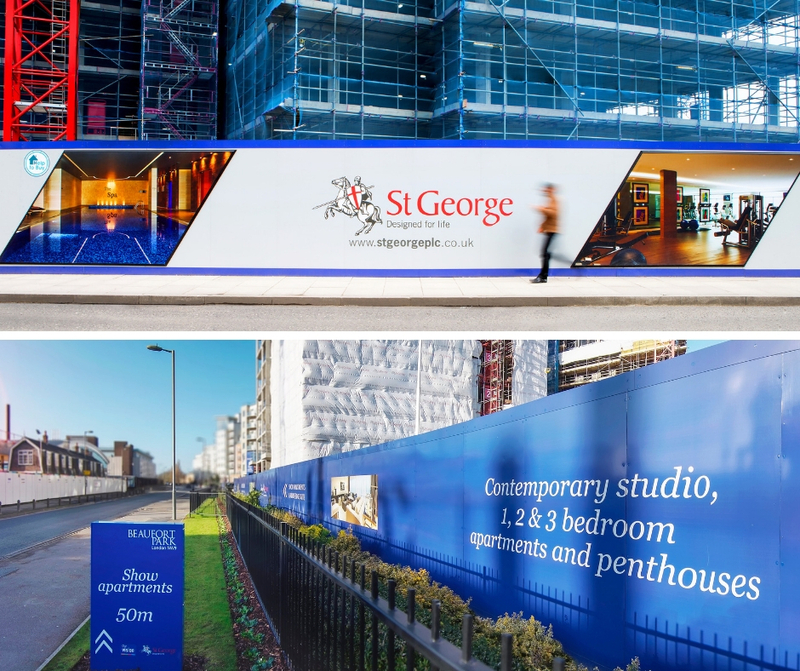 To maximise advertising hoarding and build awareness, make sure your design keeps to the development’s brand and incorporates bold colours, striking graphics and photography. Keep your hoarding design simple; you can say so much with a visual. Consider the best places for your messaging, taking into account the sizing of text for pedestrians and passing traffic. As a rule-of-thumb, one great image, a short headline of five to seven words, a call to action and your logo is ideal. Find out more about building site hoarding on this dedicated page. If you’d like to discuss a project, please give us a call on 01252 336 000.